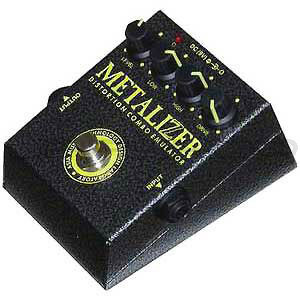 METALIZER - is a representative of guitar effects series emulating valve distortion and equipped with built-in combo emulator. The purpose of this device is clearly understood from its name - hard & heavy metal rock and its subsequent trends and styles which require specific tones and distinction of speedy riffs and licks. The traditional and characteristic for AMT simple and convenient effects control scheme contributes to this. The forced over-amplification level laid in Metalizer principle gives you the opportunity to sound heavy enough even at minimum Dist. Knob position, which determines the extent of signal distortion.